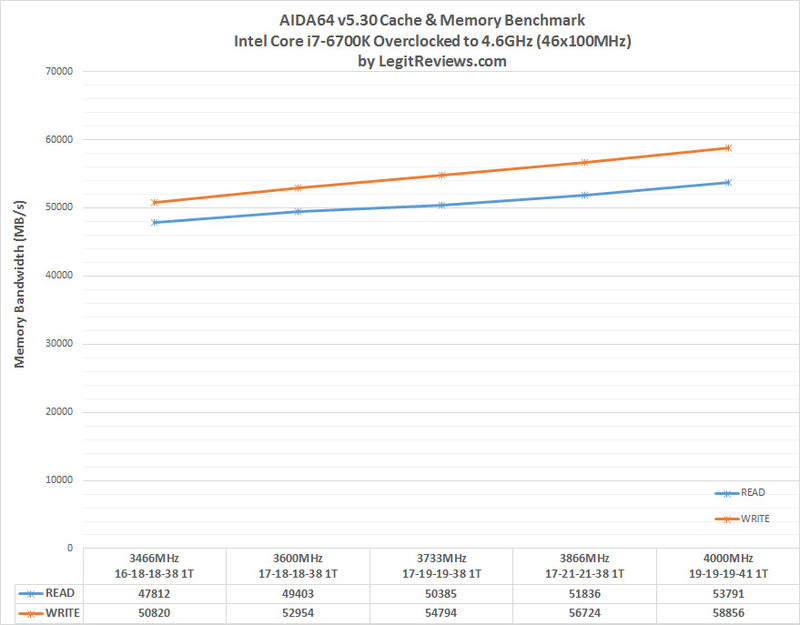 AIDA64 Extreme Edition 5.30 software (website) is an excellent benchmarking tool for looking at memory performance on any desktop PC. This version of AIDA64 implements full support for the upcoming Intel Skylake processors, adds advanced support for Microsoft Windows 10 and Windows Server 2016 operating systems, and supports the latest graphics and GPGPU computing technologies by both AMD and nVIDIA. AIDA64 Extreme 5.30 software is free to try with limited features or $39.95 to buy with 1-year of free updates. 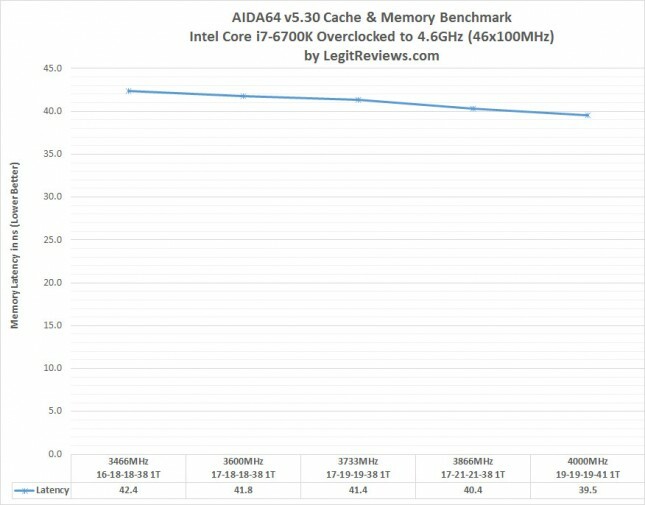 Benchmark Results: On the ASUS Z170-Deluxe motherboard with the Intel Core i7-6700K processor overclocked to 4.6GHz we saw the memory bandwidth on the G.SKILL Trident Z memory kit was 53,791 MB/s read and 58,856 MB/s when averaged for three benchmark runs. 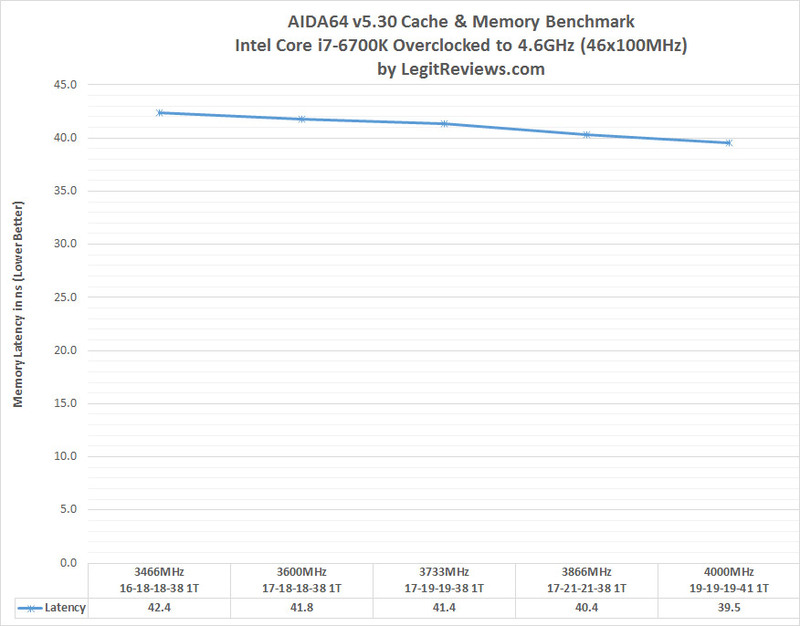 This is a nice performance improvement over the lower clocked kits! 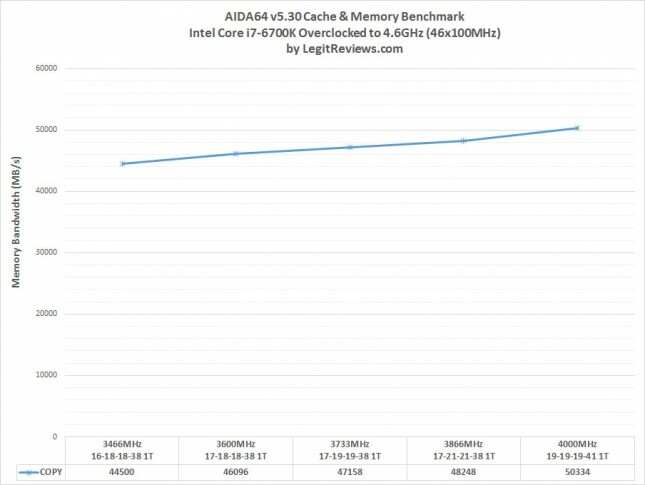 Benchmark Results: Similar performance gains were seen on the AIDA64 v5.30 copy test. We averaged 44,500 MB/s with a DDR4 clock frequency of 3466 MHz and ended up at 50,334 MB/s when we topped out at 4000 MHz. This is the first time that we have broken the 50,000 MB/s mark with a retail dual-channel DDR4 memory kit! Benchmark Results: The latency of the memory decreased as the DDR4 DRAM clock speed increased despite having to loosen the timings in the UEFI along the way. At DDR4-4000 we averaged 39.5ns!